I learned about plants as my Trentino ancestors and relatives learned: orally, seasonally, and in the forest and meadows. Erin Kenny, my teacher, is an ethnobotanist whose knowledge derives from decades of observation and foraging experience in the forests of the Northwest United States. Kenny has recorded her observations and plant wisdom in her book A Naturalist’s Journal although her primary and preferred teaching method is experiential. Her classes are held in the forest at Camp Terra, an internationally-recognized outdoor school where she teaches children and trains teachers. 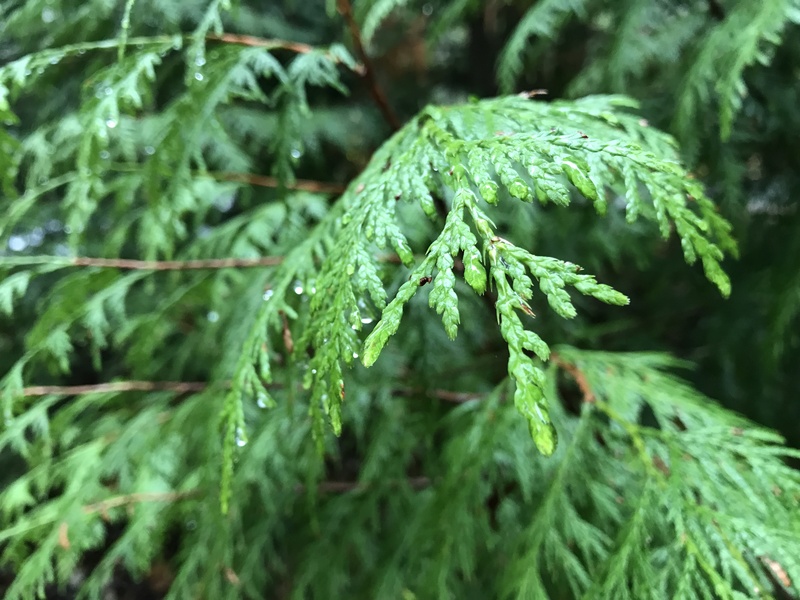 In the forest classroom, we experienced the plants in context of where and how they grow, observed them changing over the months, and eventually learned to discern differences among numerous plants that at first appeared similar. We also touched, tasted, and smelled the plants, gathering wild edibles for a lunchtime tea, brewed in water heated over a small open fire at the center of a stone circle. Kenny’s philosophy involves sustainably gathering wild plants from the area in which one lives and preserving them for use as medicine throughout the year or using them freshly-picked to eat or make healthful teas. Wild plants contain an abundance of nutrients—more than cultivated plants—that are beneficial to humans. Several of the highly beneficial medicinal herbs in Trentino are considered to be “weeds” here in the United States, including dandelion, plantain, and nettle. These plants were intentionally carried to the United States by the European colonists, according to Kenny, because of their superior medicinal value. Learning the botanical designation of plants is important to prevent confusion, Kenny emphasizes. Trentino mountain folk used descriptive names of plants probably to ensure the same clear communication: St. John’s wort, for example, has five common names listed in one book, including perforate, referring to its perforated leaves, and erba del sangue, herb of the blood, to describe the red glands of the flower that turn oil and alcohol red. The life energy of the plant is cyclic. Different parts of the plant—leaves, flowers, berries, or roots—offer healing medicine when prepared in the appropriate way at the right time of year. In the spring, new leaves are packed with energy. In summer, the fullness of the plant’s energy is held in the flowers which then become fruits and berries. Roots carry the concentrated energy in the fall, holding it until spring when the cycle begins again, and the energy is sent up to new growth. An excellent way to extract the active constituents or healing essences of plants is by soaking fresh plant material in alcohol and making a tincture. Wine, vinegar, and beer can also be used to extract the essence. While we used small amounts of vodka to make medicinal tinctures in class, my ancestors would have likely used grappa, the traditional distilled alcohol of the farmers in Trentino. The alcohol-based medicines can then be used internally as tonics or topically for liniments. For example, one medicinal formula in Trentino that is efficacious for cough is made from pine buds and grappa. The villager in Trentino who offered me some to taste said his recipe had come from his aunt, whose photo he had displayed on the counter. Making my first tincture using the green tips of Western Red Cedar, to be used later as an anti-bacterial, anti-fungal medicine internally and topically, gave me a clearer understanding of the nature and intention of herbal spirits that I had been offered in Italy over the years. Distilled spirits flavored with local herbs – often bitter – are served after a special meal in someone’s home or at a family-run restaurant, both for enjoyment and digestion. Herbs, I learned, can also be dried for later use as teas or for adding to food. The first type of plant I collected in quantity for use throughout the year was nettles, Urtica dioica, which grows abundantly where I live and is generally considered to be a weed to be eradicated from one’s land. Eaten fresh, cooked, or brewed as a tea, nettles provide a rich supply of calcium and vitamins; used externally, a tea of their leaves or tincture of their roots can help hair to grow. Their stinging leaves have traditionally been used for “urtification,” a sort of light thrashing of the skin, to relieve arthritis pain. Their stalks can be retted and made into usable fiber for making cloth and their leaves can be used as rennet to coagulate milk for making cheese. Nettles fix nitrogen in the soil, which is essential for plants to grow. Finally, medicinal plants can be soaked in oil. After allowing the oil to absorb the healing essence of the plant for a given length of time, it can be used directly or made into a salve or ointment by adding melted wax. Thickening the oils makes them less messy for application, storage, and transportation. By the end of the series of classes, I had several medicinal tinctures, teas, and salves on my shelf. The process of making them, which felt healing, brought me into close connection with nature and its cycles, with a heightened sense of awareness and interconnectedness. Recognizing a plant as a source of healing medicine bestows value to it. When I pass by a gathering place or encounter a type of plant that I have used for medicine, I feel gratitude. Additionally, I feel protective of the plant’s well-being and its environment. A natural outcome of using wild plants is the desire to protect the wild places they grow. One must pay attention to the plant over time to correctly identify it and gather it. This entry was posted in Plants, Trees, Trentino and tagged Erin Kenny, plants, wild-crafting by Mary Beth Moser. Bookmark the permalink.